Last night I woke up from an ugly dream. Otis was jumping around and he fell backwards and his head hit a wall. Blood was everywhere. My heart stopped. He jumped up, rubbed the back of his head and said, “I’m fine, Mommy” and bounced away. I woke up because there’s something really disturbing about seeing your kid’s blood. It doesn’t sit right in a mama’s stomach. I laid in bed and thought of all the mamas that have seen blood, but didn’t hear an “I’m fine, Mommy.” I cried thinking about how normal that is in some parts of the world. I prayed because what else can you do? One of the biggest changes I’ve noticed since becoming a mom is how much more I weep for these kinds of tragedies. It hurts differently. And it isn’t just because my baby is growing up in this scary world. It’s because there are so many mama hearts that have been destroyed by so much senseless violence. I’m weeping because I know how much I love my baby which means I know how much they love their babies. My mama heart understands their mama hearts no matter what language we speak or what religion we practice or what we wear on our heads. I am holding my breath because the fighting and the analyzing and the blaming is about to start because that’s how these things go. That’s how these things always go. But I’m going to pray that the believers, the ones that have faith in a God bigger than all of this, the ones that know that God saves in a multitude of ways, that we won’t run to the fighting. That we will instead run to be His channel for love and grace and kindness and peace and comfort and healing and mercy and joy in the midst of darkness. I pray that we won’t let our light go out because of fear or hate. 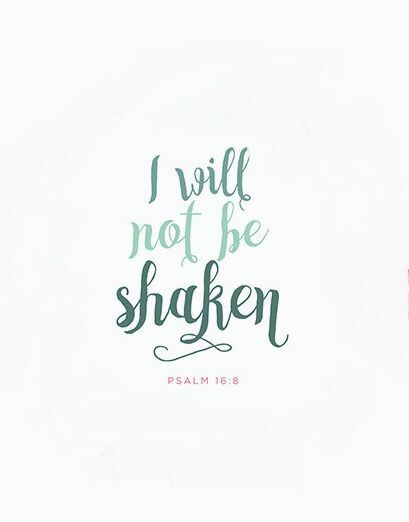 I pray that we will not be shaken.